Zoya Spring Magical Pixies – Cosmo, Vega & Lux Swatches & Review (& OPI Teenage Dream vs Lux comparison)! Hi, everyone! 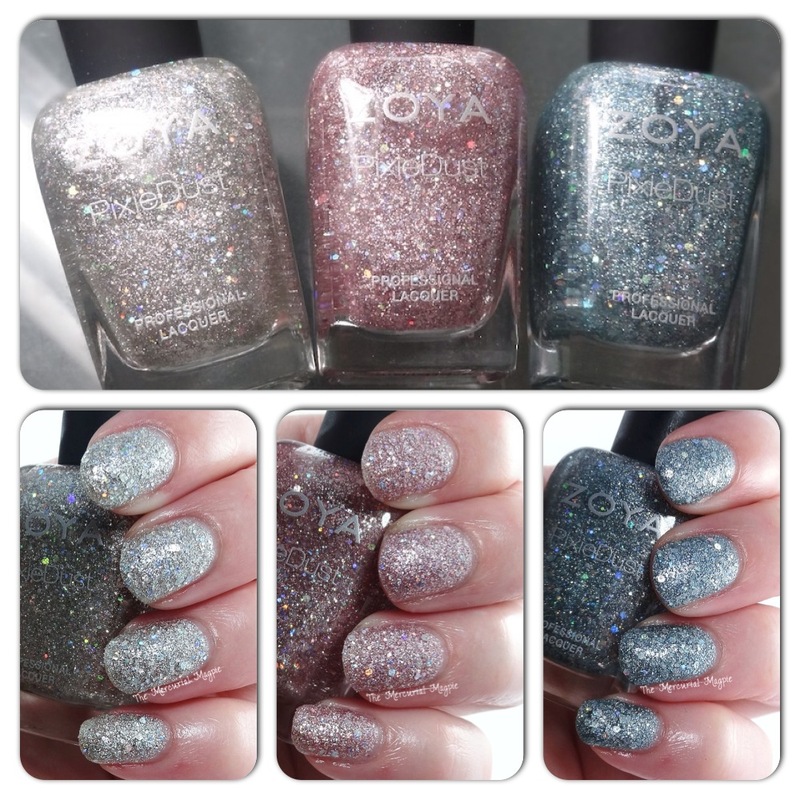 Today I’ve got the Zoya Spring 2014 Holographic Pixie Dust Magical Pixie Collection to share with you! This is a set of 3 incredible new Pixie Dusts that Zoya claims are matte, holographic & textured. The shades are named Cosmo, Vega and Lux. I love Zoya’s regular pixie dusts so I was really excited when I heard these were coming out. In fact, Zoya’s regular pixies are the only textured polishes that I really actually like. I did worry that with the holo glitter added in that these might not look great on the nail (similar to some from Essie’s winter collection) but I did find that although they are a bit more textured than the normal pixies they are still really pretty and sparkly, almost like crushed diamonds on the nail. Similar to the other pixie dusts, Zoya recommends with these that you do not use a base coat OR top coat. I personally have not found any difference using a base coat vs. not, but that might just be me. If you use a top coat on these, it makes them shiny and takes away most of the texture which can be interesting, I showed each polish both ways below. The formula on these was good, the first coat is very easy to spread with the following ones being just a bit more difficult. I used a thin first coat and a thicker second coat for each of the below swatches. I didn’t really experience much of a difference in formula with these, Vega may have been just a bit harder to spread but not noticeably so. Let’s get started with Zoya Cosmo, which is described as a silver crystal sparkle textured pixiedust with mega hex iridescent particles. Next up is Zoya Vega, which is described as a blue opal sparkle textured pixiedust with mega hex iridescent particles. Last but not least is Zoya Lux, which is described as a Rose Quartz sparkle textured pixiedust with mega hex iridescent particles. One thing I immediately thought when the press release for these came out was that Lux reminded me of OPI Teenage Dream in the bottle, so I decided to try it out with topcoat in comparison to the OPI. They may be a little similar in the bottle but very different on the nail, even with topcoat over Lux. Teenage Dream is a darker pink and the holo glitter is smaller and not as dense. Not a dupe! That’s it, folks! Overall, I think if you’re a fan of texture you’ll like these but they just aren’t for me. I’m not a fan of texture in general, if I have to wear it I like the regular pixies the most but in general I just don’t reach for texture. I do think these are nice with top coat, though. These retail for $10.00 and are available now. What do you think about this collection? Anything you’re going to pick up? You can find Zoya at their website here, be sure to like them on facebook as well to keep with their new updates!